Welcome to Tennessee fly fishing guide David Knapp’s Trout Zone Anglers, your one stop shop for all things fly fishing in Tennessee. If you are looking for information on specific waters, look no further. Here you can find information on Great Smoky Mountain streams, Tennessee trout tailwaters, and warm water options. If you are looking for a fly fishing guide for fishing in Tennessee, then contact me for more info or explore available options here. Perfectly situated on the Cumberland Plateau, we offer services to anglers visiting Knoxville, Nashville, Chattanooga, and of course, the Great Smoky Mountains National Park. If you are visiting Townsend, Gatlinburg, Pigeon Forge, Cherokee, Bryson City, or any other destination near the Smokies, please consider us to help with your fly fishing trip. As a professional Tennessee fly fishing guide, I would be happy to show you some of my favorite waters. Furthermore, with my background as an educator, I am happy to teach you the skills and techniques needed for success on a wide variety of waters. In addition to several years as a secondary math teacher, I also have a masters in outdoor education. As you may have guessed, the great outdoors are my favorite classroom, and I enjoy teaching the art of fly fishing.The Great Smoky Mountains National Park, Caney Fork River, and Clinch River are my primary home waters. Additionally, I also fish and guide on the streams of the Cumberland Plateau for smallmouth bass and musky. The Great Smoky Mountains National Park is an angler’s dream with 800+ miles of trout water available for exploration. Native southern Appalachian brook trout abound. 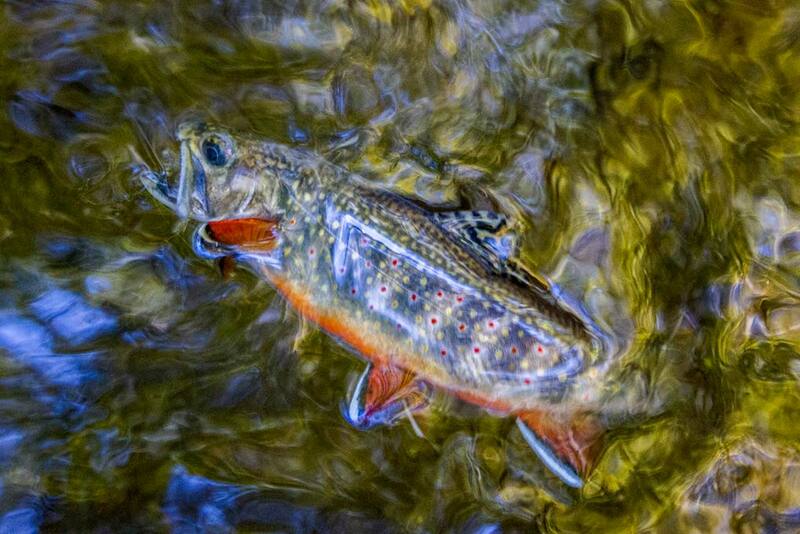 These fish have been restored to many miles of stream in the mid and upper elevations of the Smokies. Consequently, anglers can now fish for these beautiful and unique fish in many streams across the Park. Wild rainbow and brown trout dominate in lower elevation streams. A fly fishing guide will speed up the learning curve tremendously on these waters. As a professional Great Smoky Mountains fly fishing guide, I specialize in teaching the techniques and skills required for anglers of all skill levels to find success on our beautiful streams. As a fly fishing guide on the Caney Fork River, I specialize in teaching anglers the skills necessary to effectively fish this fine tailwater river. As a result, anglers looking for a chance at a trophy rainbow or brown trout need look no farther than the Caney Fork River. Anglers willing to put in some time and effort will reap the rewards. My drift boat allows us to access many parts of the river and is the best way to fish here. In addition to float trips, I also offer guided walk and wade trips on the Caney Fork. As a Clinch River fly fishing guide, I enjoy watching people go from frustrated to successful on this rich but technical river. Many anglers give up after one trip to the Clinch River. The trout are there and often highly visible in the crystal clear water. Catching them is far from easy. That is where we come in. With the right flies and presentation, these trout are catchable. Float trips in our beautiful ClackaCraft drift boat will get you away from the crowds at popular public access points. Come enjoy a day on this fine Tennessee tailwater. Walk and wade trips are also available for anglers wanting to learn how to approach this river on foot. Anglers looking for the opportunity to hook huge trout in an idyllic mountain setting need look no further than the Cherokee tribal waters. A designated catch and release section on the Oconaluftee and Raven Fork offers the chance at some truly large trout. These fish are not pushovers and this trip is not recommended for beginning anglers. Think you have what it takes to catch these monsters? Talk to me about setting up your trip on this amazing water. For fly anglers looking for something different, I also offer guided fly fishing trips for smallmouth bass and musky. These trips are on the upper Caney Fork River system, Obed River system, Cumberland River system, and Big South Fork River system. For 2019, smallmouth bass trips in east Tennessee will also be offered. To learn more about fly fishing guide trips, check out the guided fly fishing trip information page. Finally, If you are looking for a fishing report, you can find that on the Fishing Report Blog or you can find a lot more great content at my long time blog the Trout Zone.